Keck Medicine of USC specialists keep performing artists in the spotlight. Javen Smith was singing for hours a day preparing for a major role in a USC production of the musical Songs for a New World, known for its vocally demanding score, and he felt fine—until his voice went out. His vocal coach in the USC Thornton School of Music reassured the worried singer that a doctor could help. Smith turned to Keck Medicine of USC, where otolaryngologists, physical therapists, orthopaedists and other specialists understand and treat the special needs of musicians, singers, actors and dancers. Smith was afraid that he had irreparably damaged his voice, but a laryngologist at Keck Medicine reassured him that a virus had only temporarily immobilized his vocal cords. She advised him to rest his voice and modify his performance. “I was able to get through opening night,” Smith says. But artists can get specialized help quickly through resources like Keck Medicine’s USC Performing Arts Medicine Center within the USC Orthopaedic Surgery and the new USC Voice Center in the USC Tina and Rick Caruso Department of Otolaryngology — Head and Neck Surgery. Keck Medicine physicians draw patients from USC Thornton and the USC Kaufman School of Dance, the Los Angeles Philharmonic, LA Opera and Los Angeles Ballet, as well as quartets, bands, musical theater actors and soloists. The center offers a dedicated hotline that musicians can call for appointments. It’s a collaboration with USC Thornton and its comprehensive Musician’s Wellness Initiative launched in 2015. Orthopedic surgeons with expertise in the hand, elbow, shoulder, hip, knee, foot, ankle and spine are available not only for musicians, but also for artists ranging from stunt professionals to theater actors. These surgeons work closely with physical therapists to help artists heal from muscle, joint and bone problems. 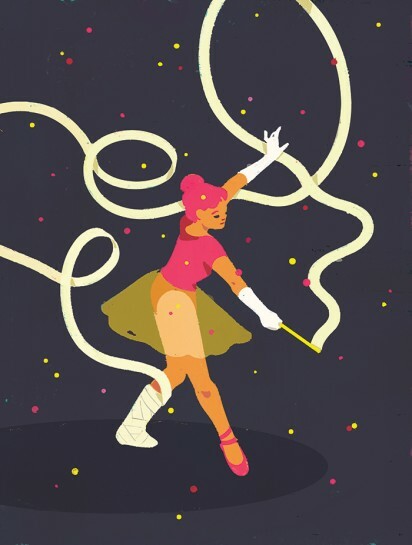 Seth Gamradt, director of orthopaedic athletic medicine, notes that athletes and performing artists have several traits in common: “passion, talent and drive.” Their key difference is the types of injuries they often experience. For athletes, collision injuries or muscle pulls and sprains dominate. For musicians and dancers, problems grow from overuse. He works closely with patients to manage their hand problems conservatively, performing surgery only when appropriate. 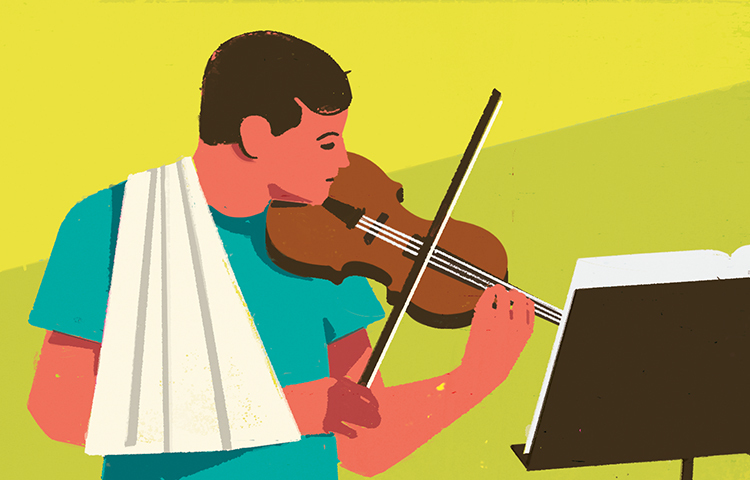 The physicians all agree: “No pain, no gain” might be a common motto for athletes, but it doesn’t work for musicians. Veteran artists know that firsthand. “With the fine motor control that musicians must have, pain indicates that something’s wrong. It should never hurt to perform,” says William Kanengiser ’81, MA ’83, an associate professor of practice in classical guitar and a member of USC Thornton’s Musician’s Wellness Initiative committee. USC Thornton offers wellness information online, as well as lectures and workshops on topics like performance anxiety, musculoskeletal issues, hearing protection, and posture and ergonomics for musicians—some of which are open to the public. “We want to build awareness among students that good health and good habits are lifelong essentials for performers,” Kanengiser says. That applies to vocalists as much as to a trombone player or cellist. Singing is an athletic event. The vocal cords are touching each other at a rate of 200 to 250 times a second. Over eight shows a week, that’s a hard thing to do. Among vocalists, illness, overuse and trauma can hurt a voice, as can a lack of sleep, poor eating or dehydration. As young artists learn how to use their instruments, they’re also just beginning to learn how to care for them. Just like their orthopedic colleagues, Keck Medicine physicians in the USC Voice Center try to get to the source of their patients’ problems to figure out the best way to treat them. The hallmark tool for diagnosis is called laryngeal videostroboscopy, a synchronized flashing light that’s passed through a flexible endoscope into the throat. It gives doctors a slow-motion view of rapidly vibrating vocal cords. The strobe effect, Johns quips, is “like taking your vocal cords to a disco.” During the procedure, vocalists sing, sometimes accompanied by a keyboard, enabling doctors to accurately assess problems with pitch, range or specific notes. The vocal cords or folds are just one-sixteenth of an inch thick and prone to injury, but they don’t have much sensation, so you can injure the folds and not feel it, says Johns, recently named by Billboard magazine as one of “Music’s Top Throat Doctors” nationwide. Complicating the issue: Performers can sometimes “power through” and develop workarounds that make the problem worse. Voice troubles may also increase with age, he explains. Changes to muscles and mucous membranes over time can result in loss of strength, agility and endurance. When vocal fitness workouts don’t help, physicians can inject fillers to plump up thinning vocal cords. Johns also is researching rejuvenation of vocal cord tissues using a patient’s own stem cells. Recently Justin Fatu Su’esu’e, a USC Thornton master’s student in opera, got a good look at his own vocal cords. At a Musician’s Wellness Initiative event, laryngologists were offering free baseline videostroboscopies to USC Thornton students. Su’esu’e, rehearsing for a lead role as Der Tenor/Bacchus in the Richard Strauss opera Ariadne auf Naxos, opening in April at USC, hasn’t had any problems yet. But he wondered if his vocal cords might be getting damaged. At age 30, his voice is still maturing, and he aspires to an international career. “Knowing you have medical professionals here at USC who understand the science of what you’re going through, and are just a call or email away, is quite reassuring,” he says. For performers, he believes, consistency is more crucial than just one great night. “To build a long career of great nights—that’s why keeping your body healthy is so important,” he says.